A sandy beach, scenic environs, and standout decor made Priyanka and Ashok’s wedding a treat for all the senses. 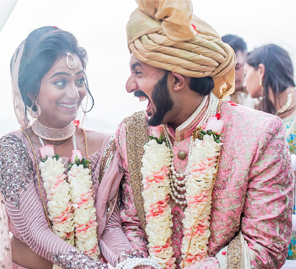 Priyanka and Ashok had their hearts set on taking their vows on a sandy shore. The InterContinental Chennai Mahabalipuram Resort proved to be the perfect place for their dream nuptials. Their photographs are proof of the fun and joy at this special occasion. 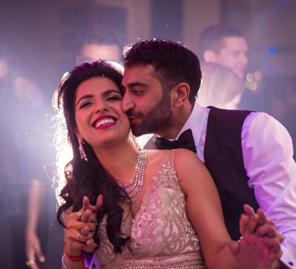 Here, we share all the interesting details of their destination wedding and their journey of love. There’s nothing this couple loves more than to hop on a plane and travel the world. Ashok decided to propose to his lady while they were travelling Europe’s romance capitals. On the 10th anniversary of them getting together, on July 2nd 2015, on a gondola gliding through the canals of Venice, Ashok asked the gondolier to take a photo of them and he got down on one knee, took her hand and asked her to spend the rest of her life with him. It was the best day of their lives. “The InterContinental Chennai Mahabalipuram Resort is a very beautiful and modern resort. The buildings are inspired by temple architecture and they have gorgeous beaches: the perfect spot for our dream wedding, on the sand, at sunrise. We chose Radisson Blu for our guest accommodation and the other wedding festivities. The size helped because we were able to have three other wedding celebrations in three very disparate venues. The experience at each was unique. We also liked the fact that it is very close to the Mahabalipuram heritage site and had great seafood restaurants. Our guests thoroughly enjoyed their stay! Both resorts have amazing hospitality and went above and beyond our expectations. The staff was very accommodating from Day 1, and even during our wedding functions they ensured everything was perfect. Priyanka says, “Going with Annada and Manoj of Sketchknots was one of the best decisions we made. We started working with Annada two years prior to the wedding. She was incredibly patient, kind, and understanding. She immediately understood what we wanted and executed it perfectly. Trying to pull off a destination wedding from halfway around the world would have been impossible if not for Sketchknots. It took the stress off of us. We have never met a team so dedicated to the work they do. They also introduced us to amazing vendors; from the wedding favors, to the wedding cake, the musicians, the DJ, the emcee, the makeup artist, and especially the décor. We have no words to describe how much of an amazing job our décor team (A-Cube Project) did for all four of our wedding functions. They definitely went above and beyond our expectations, took our vision and made it a million times better. Zaid was incredibly patient and kind and catered to the fact that we were not physically present in India through late night or early morning meetings. One fact that we loved about A-Cube Project is how they left extra touches and surprises for us at each of our functions, which were very personal, meaningful, and sweet. We came across Haha Photography on social media and decided to have an engagement photo shoot with them during one of our prior visits in India. Once we received the final video and pictures, we were sure. They have one of the most talented videography and photography teams we have ever come across, and each one of them was patient, hardworking, and brilliant. The theme for the function was Bollywood. Beautiful decor added color to the ambiance and the bride and groom complemented each other in traditional ensembles. White decor with fresh, bright flowers was the highlight of this beach wedding. The mandap was rustic in its vibe and set up on the sandy beach. The bride looked radiant in her pink saree paired with traditional gold jewellery followed by a second outfit, a bright red saree. The groom complemented his bride in a beige and gold creation by Shyamal and Bhumika. After a divine traditional ceremony by the beach, it was time for a glitzy reception in the evening. The Midsummer Night’s Dream themed reception was an evening filled with good music and lots of dancing. The decor for this event was sophisticated as the couple wanted to add a touch of glam to the otherwise muted setting. They used lots of flowers, chandeliers and bright lights to create the backdrop of the stage. The whole vibe was elegant and romantic.